The electric actuated butterfly valve uses a circular disc contained within a ring style body that sandwich mounts between pipe flanges, which rotates by a quarter turn by a central shaft with a seal typically created by the outer edge of the disc compressing a resilient rubber seal located within the ring, as the valve closes. Body styles are typically either wafer type or fully lugged and tapped to suit either metric or ANSI flanges, although double flanged or groove ended versions are available. Electrically actuated butterfly valves allow the position of the butterfly valve to be automatically (or motorized) controlled remotely whereas manually operated butterfly valves require human intervention at the physical location of the valve. 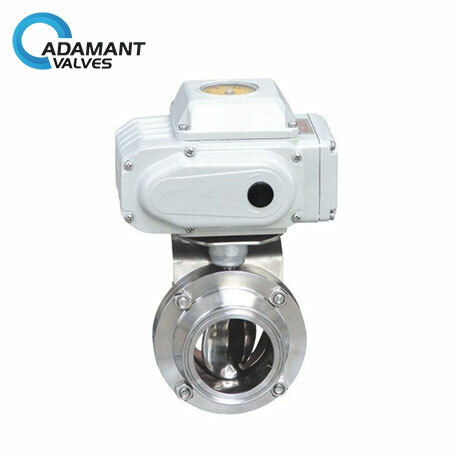 Compared with the more traditional flanged gate valves, an actuated butterfly valve is lighter in weight making it easier to install, and offers more favorable pricing. 145psi (10bar) for DN25/1"-DN100/4"; 116psi (8bar) for DN125/5"-DN150/6"; 73psi (5bar) for DN200/8"-DN300/12". 14 ~ 248°F (-10 ~ 120°C) with EPDM seat, -58 ~ 356°F (-50 ~ +180°C) with VMQ (Silicone) seat. Ra 16 ~ 32µin (0.4 ~ 0.8µm), Ra 32µin is the default. Handles: 4-position pull handle; multi-position handle with the plastic cover or in pure stainless steel. Actuators to reach automatic operation: pneumatic stainless steel actuator (vertical type), the pneumatic aluminum actuator (horizontal type), and the electric actuator. Valve ON/OFF is conducted by switch circuit with outputting active contact signal which can show a fully open or fully closed state of the valves. Valve ON/OFF is conducted by switch circuit with outputting passive contact signal which can show a fully open or fully closed state of the valves. The opening or closing operation is realized by switching "open" or "close" the circuit, outputting a relative group open or close degree current signals. The opening angle of valves is controlled by switch circuit, with potentiometer outputting resistance signal corresponding valves opening angle. Intelligent regulation and control are conduct by receiving the standard signal 4-20mA. DC, 0-10V. DC or 1-5V. DC outputted by the computers of instruments standard feedback signal 4-20mA. DC is also outputted.